Kempty Falls are one of the most beautiful and biggest waterfalls nestled in the enchanting hill town of Mussoorie. Visitors throng this place in large numbers to enjoy trekking up to the pristine falls and see the cascading waters. The falls are surrounded by high mountain cliffs that mesmerize the trekkers. Located at an altitude of around 4500 ft above sea level, the place is certainly a paradise where people can spend many memorable moments amidst the lush green vegetation. 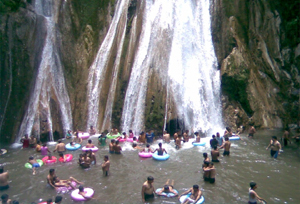 The Kempty Falls are about 13 kms away from Mussoorie. The trek is full of terrace fields, crystal-clear rivers and lush forests. The trek also covers a visit to the Malsi Deer Park, prominent attractions of Mussoorie, Jwala Devi of Himalayan peak and ropeway ride. The salubrious climate of the place will rejuvenate your mind, body and soul. The scene of clouds kissing the mountains provides a delight to the eyes. The verdant landscapes and diverse flora and fauna will fill you with an utmost joy. Kempty Fall trek offers a wonderful chance to the adventure enthusiasts to explore the beauty of the place, which is really a heaven on earth. On arrival, pick up from the airport and transfer to a hotel. Overnight stay at your pre-booked hotel. Morning transfer to the New Delhi station to board a train for Dehradun. On arrival meet our representative at the station who will transfer you to the hotel. In the evening, use the free time to explore Dehradun. Overnight stay in a hotel. After breakfast 35 kms drive to Mussoorie with packed lunch. On the way, visit Malsi Deer Park, see major attractions of Mussoorie and enjoy a ropeway ride. Afternoon drive to George Everest House, which is 8 kms away. Dinner and overnight stay in camp or hotel. After breakfast 6 kms Trek to Jwala Devi. You will see a grand view of Himalayan peaks, Yamuna River and Mussoorie on this way. In the afternoon trek back to Camp. Dinner and overnight stay in camp or hotel. Early morning we will go for a 12 kms trek to Bhadraj temple with packed lunch. From Bhadraj temple view of Himalayan peaks, Shivalik ranges, Valley of Flowers, Dakpathar and Asan Barrage. In the afternoon 12 kms trek back to the camp or hotel. Dinner and overnight stay in a camp. After breakfast, 8 kms trek to Kempty falls with packed lunch. After having bath in Kempty falls drive back to Mussoorie and then drive to Dehradun 50 kms. On arrival transfer to the station to board a train for Delhi. On arrival meet our representative at the station; transfer to a hotel. Overnight stay at the hotel. Morning sightseeing tour of Delhi and in the evening transfer to the hotel to catch the flight for onward destination.